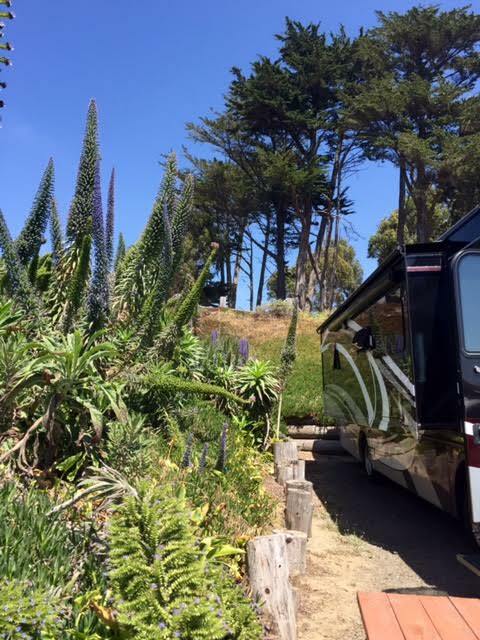 We knew when we left our wonderful spot at the harbor of Bodega Bay we were moving inland for our next stop. Still traveling Hwy 101, but the stretch from Santa Rosa to Garberville moves away from the coast. We had reasons to stop for a couple nights in Ukiah. One was the chance for a visit with our sister-in-law, Marilynn. The other was a day trip to the Fort Bragg area. 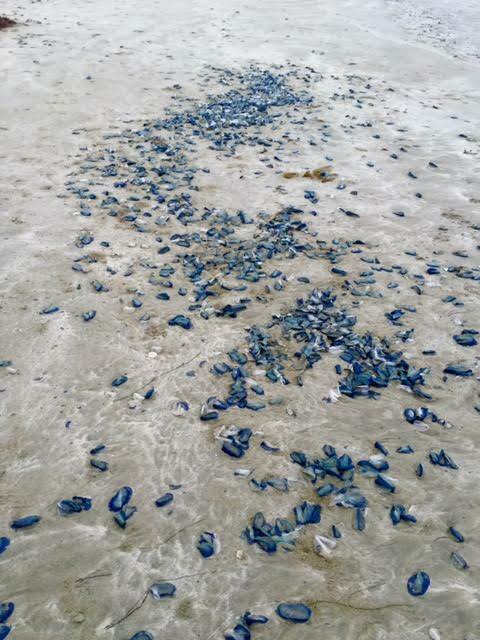 Staying along the coast during the summer is not an inexpensive option. 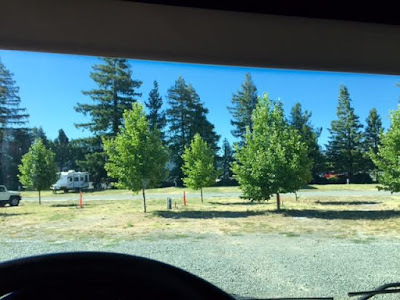 The Redwood Empire Fairgrounds has a year-round RV "park" with FHUs, plus showers and laundry if needed, for half the cost of every other place we've stayed. 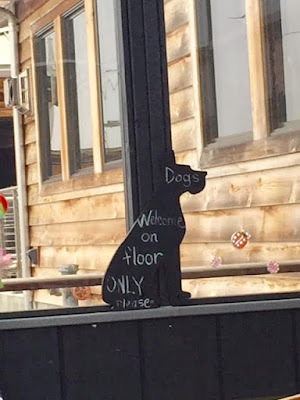 We wouldn't stay there again, but for only one reason. Sand burrs. Everywhere. What look like small grass strips between each site are just thick patches of sand burr plants. Tessa had fifty stuck to her in a couple minutes, and we tracked them in on our shoes as well. Horrible. And it was hot. Even though it was cooler than it had been for the past two weeks, with another week of triple digits expected when we left, the 90 degrees was hotter than anywhere we'd been - and anywhere we were going! Thankfully the ACs worked well and we slept comfortably both nights. Our visit with Marilynn was delightful as expected. She got to see our new home, we had a decent dinner in town, and most importantly we just got to spend time together. Did I take a single damn photo? Again....no! I did however take a lot of them the following day. Fort Bragg has long been on the top of Bill's list of places he'd want to live. We were there a couple years ago, and I had to agree with him. 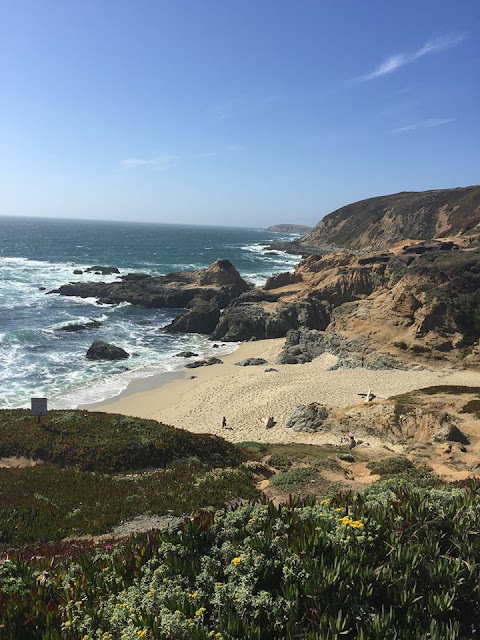 This visit was even more convincing as we spent time along the river, in the little town of Mendocino, and along the beautiful cliffs above Glass Beach. 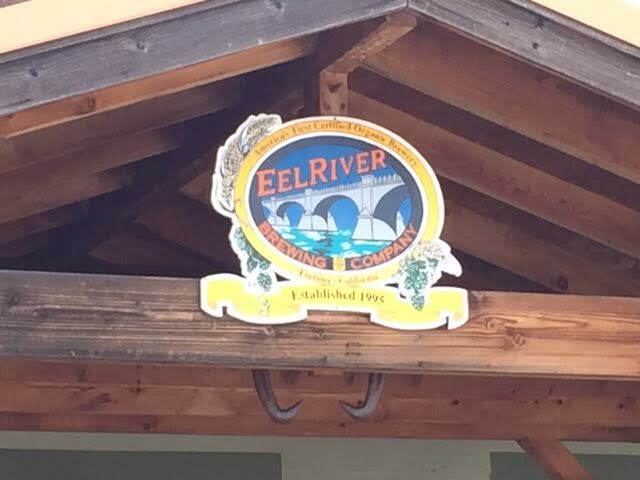 Eel River Brewing Company is not far off Hwy 101 in the town of Fortuna. 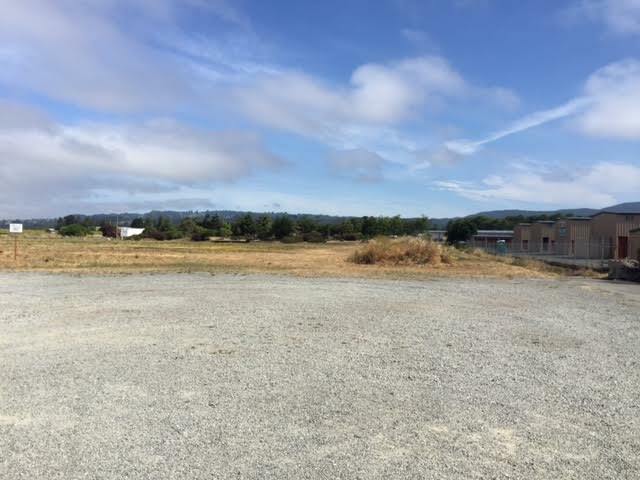 The gravel lot with no trees behind the taphouse is not pretty, but it's level, safe and fairly quiet. The smoker at the back of the building smelled divine, but we didn't stay there for the grub. 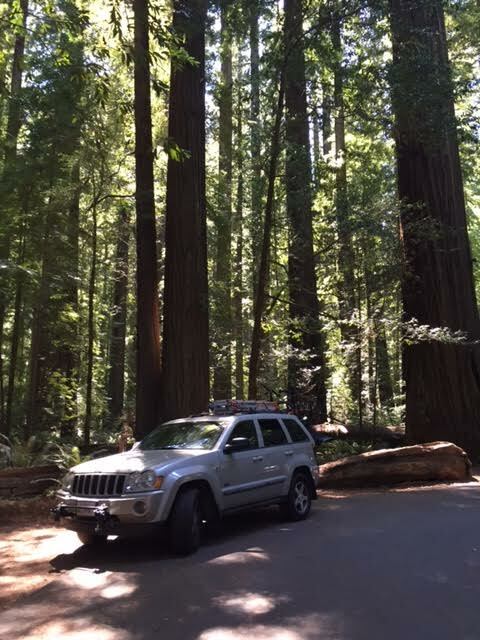 This is the land of redwoods and fishing. The Avenue of the Giants is 15 minutes south of Fortuna and completely took my breath away. We spent all afternoon exploring the main road; a couple small, unmarked roads that took us down to the forest floor; and the depressingly low Eel River. We stopped at a bait store in Scotia who isn't selling any because there isn't enough water for fish. Sad. Scary. 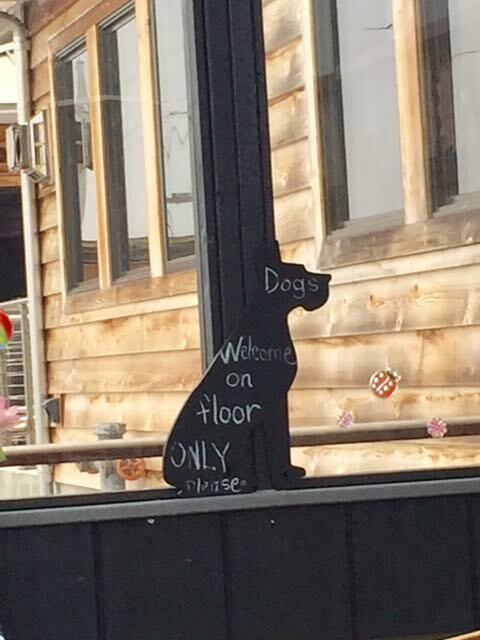 Unfortunately the eateries in Fortuna with outside dining do not welcome dogs. Including the taphouse. So I ordered our dinner to go and had to forego trying out their tasty sounding brews. The place was hopping for a week night, and the smoked BBQ ribs were very good. With a short travel day ahead, we slept in and took our time getting on the road. 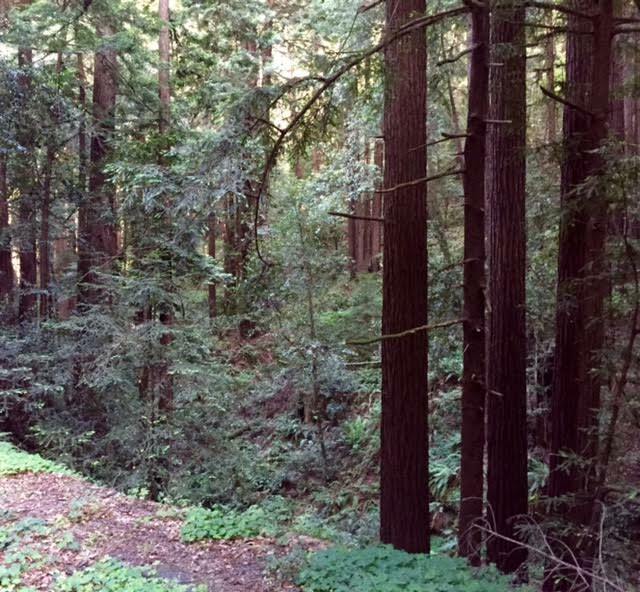 Being back along the coast with the mix of redwoods and wildflowers, the scenery was mesmerizing. Wow. Why did we live in the congestion and heat of the rest of the state all our lives? I suppose it was that pesky "making a living" thing, but man am I glad we're getting to see it now! I've seen pictures of Trinidad sometime in my past, and remember that it was beautiful. Still I wasn't prepared for the scene as the highway crested overlooking the bay a few miles north of Arcata. Thankfully we had reservations here for eight nights, because I don't think I could have kept driving. This is by far the coolest place we've been. We had to hit the road when we did because if I spent anymore time "preparing" I was going to drive myself and everyone else nuts. Researching, reading, purchasing, organizing, reading, planning, routing, reading......nearly three years of getting ready. Still I knew that nothing would take the place of actually being out here. That was part of the preparation after all - to be ready for anything. We've been on the road about two weeks and there is plenty of anything out there waiting for us. We haven't even left our home state yet. So are there already some "un-expecteds"? Naturally. Do I think I'll forget them if I don't capture them now? Of course. Waking up in a beautiful place knowing you don't have to go home, because you're already there. Sonoma County, CA, is a beautiful place. 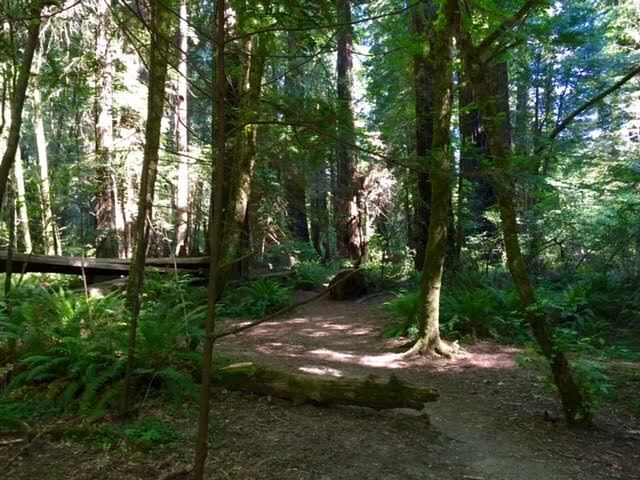 Rugged beaches, rich green pastures, redwood forests, meandering rivers (with very little water), small artsy towns, vineyards.....something for just about everyone. With the current triple digit temperatures and smoke-filled skies in other parts of the state, it is definitely the place to be this week! After our trip to the wilds of Pt Reyes on Wednesday, we decided Friday was a good time to head inland and spend some time in the forest. Just before the small town of Jenner, Hwy 116 turns off to Duncans Mills. Literally in the curve of the road is the local general store and several artisan shops. The Cape Fear Café serves a delicious breakfast, and has outdoor seating, so we made that our first stop. Once again we were earlier than is appropriate for a laid back burg in the semi-wilderness so we hung out on the boardwalk and I played with the camera. In some places the Russian River is little more than a wide creek, but the hills and pastures are still green. There are cattle of every color scattered throughout the area. The highway winds through forest so thick it is nearly dark. The creek bed along the road is dry with occasional ponds that will also die without a few good rainstorms. It is extremely beautiful, and extremely desperate. The small town of Occidental fills up the sudden opening in the trees, with old brick and clapboard buildings and a couple newer motels. I wander a few small shops while Bill waits with Tessa. Given how he loves to shop it's a huge sacrifice <ha>. There aren't a lot of people on the road and we take our time making the loop back through Bodega and return to our spot on the harbor. 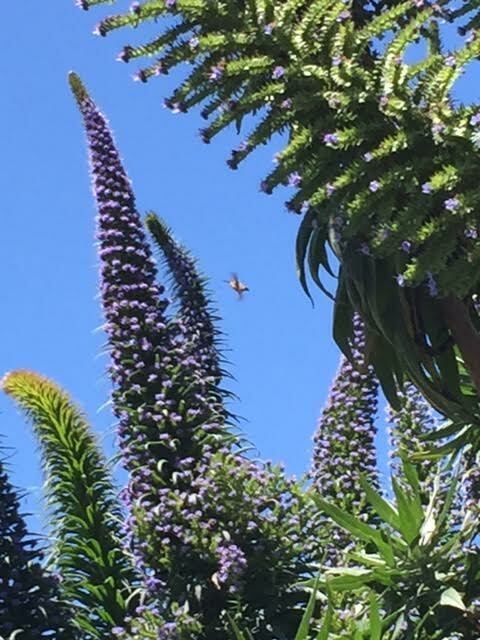 Since our arrival, we have been visited daily by this female hummingbird. Given the number and size of these cone flowers beside our rig you would think there would be dozens of them. She might be small and flighty, but this girl can keep a secret! 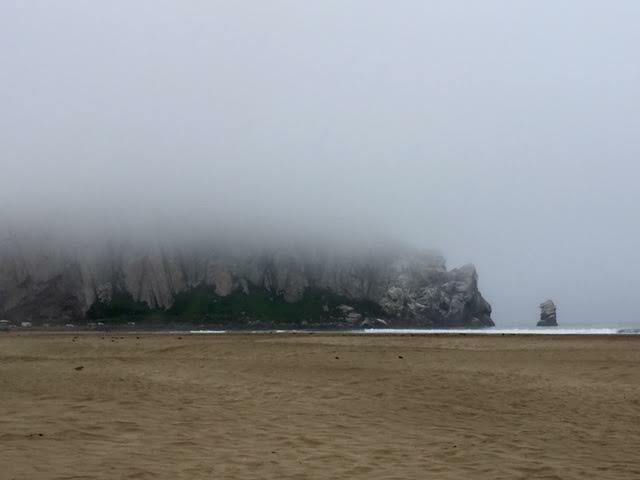 One of my favorite places is Pt Reyes Peninsula in Marin County, California. 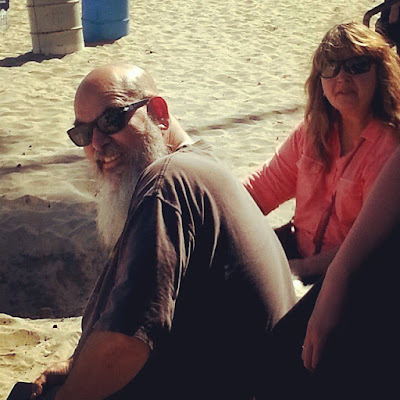 Used to horse camp there and ride to the ocean through the forest, took the boys to play at the beach when it was triple digits at home, and spent some girl time with the BFF for a few days. I shared it with Bill a couple years ago, and we returned for a day trip during our stay in Bodega Bay. Disappointed that the Pt Reyes Station was closed on Wednesdays so didn't get to enjoy the delicious Reuben I had been looking forward to :-( , but a quick deli sandwich got us back on the road. There is something about the peninsula that is both rugged and magical. 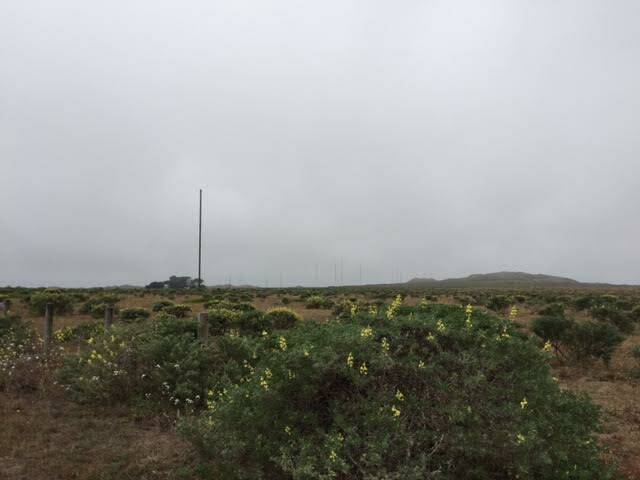 In addition to the lighthouse, there are eight protected family farms designated as A through H, AT&T's major communication center, the Tule Elk Preserve, Drake's Beach, North Beach and South Beach. 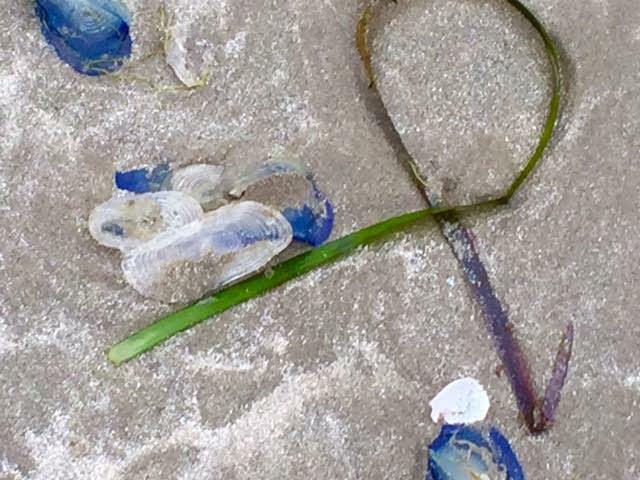 One thing I love about this wild place is the very different shorelines. Drake's Beach is black, hard sand and calm waves. There are high cliffs on both sides of the small bay, and it feels protected. 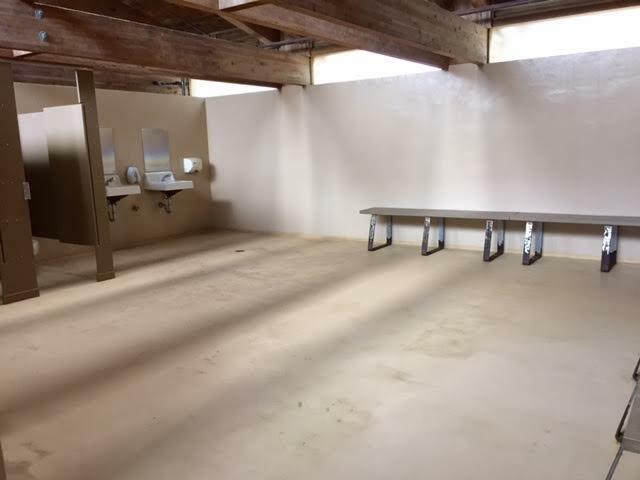 There is a small VC with information on Sir Francis Drake, large restrooms (huge), and a snack bar open on weekends. North Beach, on the other side, is white, soft sand and violent surf. It is wide open ocean with nothing to break the power of the pounding waves. Other than a parking lot and restrooms, there is nothing here but multiple signs suggesting that you should be somewhere else. 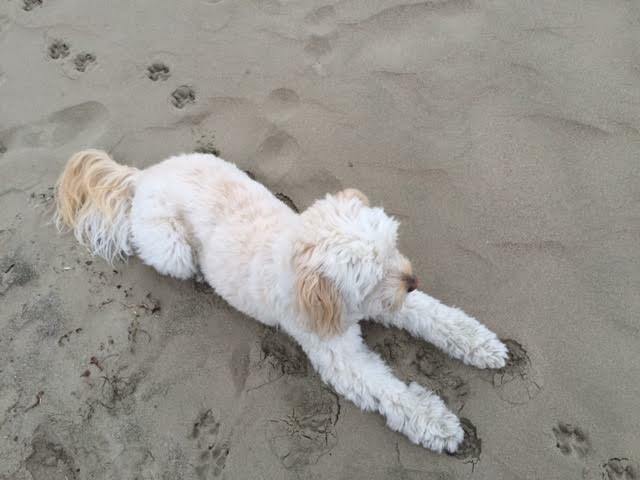 Don't let those loud waves get me Daddy! The contrast is pretty extreme. Everything was shrouded in swirling, cold fog, giving one the feeling of entering a secret world from which you might not return. The road is narrow, rutted, full of pot holes. The terrain is a mix of succulents, tall grasses, pasture, dunes, and large gray rocks that somehow stand out from the equally gray skies. It is wonderful. Although rugged, the environment is fragile. Doggies only allowed on North and South Beach. For my birthday Bill gave me a Canon Powershot SX50, and I've been experimenting with using a real camera for the first time. The zoom is amazing, although to keep the camera steady enough to actually capture something (especially in the wind) is a challenge for me. While the muted day made for monochrome shots, it was still a lot of fun to capture this fabulous place. Blogger is having issues with posting photos so these small ones are all I can get today. Our last day in Morro Bay we ventured north to Cambria for lunch. A cute little town between the pine-covered hills, it is one of those places where nice galleries, artisan shops, and good local eateries have managed to keep out the tourist-trap-tee-shirt vendors. We found a popular outdoor patio to enjoy a tasty meal and people watching. We took our time going back and found out we had missed a friend from high school and her husband :-( Also found out it was her cousin who cancelled their reservation, giving us the spot for the extra days - true serendipity!! But we weren't without visitors. Bill's cousin and her husband were in Cambria and on their way south so they stopped by for a quick visit. They ate at the same place we did, only four hours later - starting to get strange? 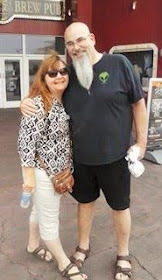 Then the brother of the first friend, also a high school friend, stopped by on his motorcycle on his way to the rest of the family......so cool!! Sunday morning we were on the road by 8 AM so we could drop off the rig at our next stop and then meet our nieces and nephews in Santa Cruz. We are almost always the only motorhome on the road before 10 AM......I feel like we're breaking some code. I expect the email any day now telling us we have to pay a fine. So the trip is uneventful until we get off the freeway. The big GPS (Randy) and the IPhone GPS are at odds. I say let's take the closest route because we're in a hurry. Randy doesn't like this and starts screaming that there is an RV weight violation ahead. Very disconcerting. I see No Trucks signs ahead and bail on that route. We take the other route. We are coming to an intersection and one GPS says turn right while the other says turn left - seriously? The roads are narrow, with low hanging branches smacking the roof. I don't like it. The park doesn't answer the phone when I call for their directions. Bill assures me the next right will get us there on a "bigger" road. He's right and even though the short road to the park is tight we do find it easily from there. 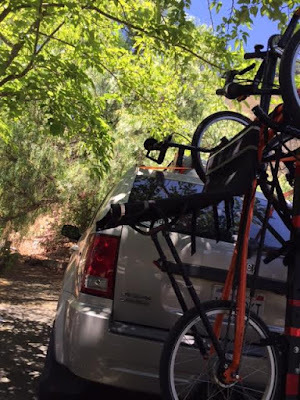 Mostly permanents at the Uvas Pines RV Park, a very small place with lots of beautiful trees. Our site backs to a large golden hill, our neighbors' sites are neat and clean. We're there five minutes before we head out in Sprocket. The drive over Hecker Pass is beautiful, and even with the short construction delay we make it to Hwy 1 quickly. Sunday traffic is stop and go all the way to our exit. Sunday parking is non-existent so we bite the budget bullet and pay $20 for a spot across from the restaurant where 9 of our family members are waiting for us. It is always a treat to spend time with Wayne's kids and grandkids, and this time is no different. 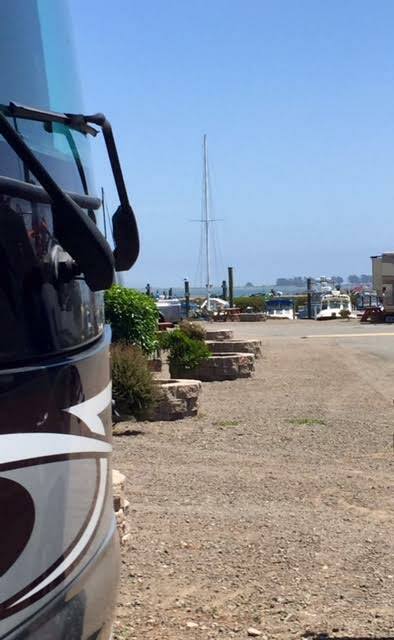 A nice lunch and time by the beach (no doggies so we hang out near the pier), goes by quickly and all too soon we're headed back to Morgan Hill. Again, didn't think to take a single pic. Borrowed this one from Jessica's FB post (thanks niecey), to prove we were there. The delays through the pass are much longer now. 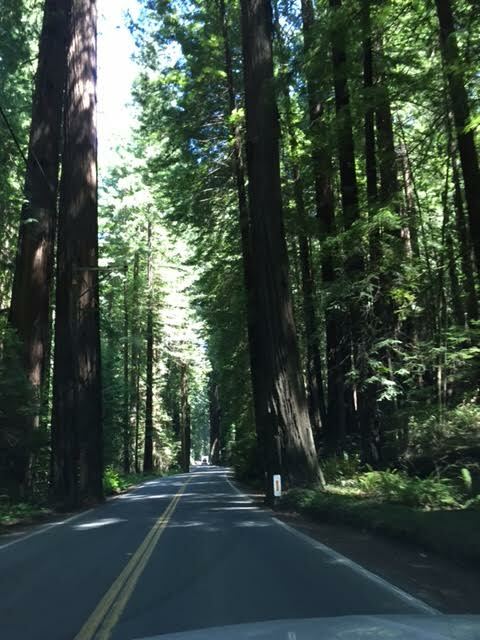 But when you're driving through a beautiful forest you really don't mind sitting there for a little while and just soaking it all in. We tucked Sprocket in the trees at the back of our site, made a light dinner and went to bed early. Monday we relaxed at the site, reading and doing a little housekeeping. 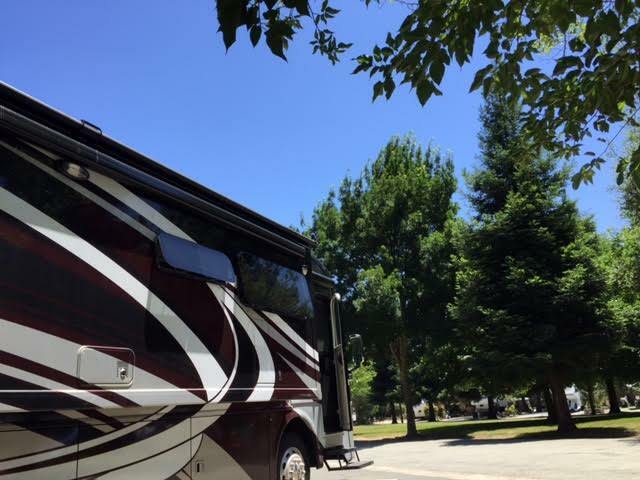 Made a quick trip for groceries, discovering a very easy, RV-friendly route straight to Hwy 101. WTH? I swear the GPS gods have it out for us. 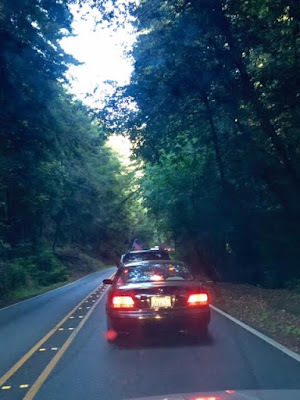 Yesterday we get back on Hwy 101 heading north at a code-approved 10 AM. We re-route to miss driving through San Francisco, and cross the bay on the Richmond Bridge. After we pay the outrageous toll of $20 because we're towing. If we had driven separately it would have been $5 for each vehicle. My disgust is rapidly replaced by acrophobia. We climb at least 5 miles straight up on a narrow strip of concrete that is swaying in the 100 mph gusts over churning seas filled with boulders.......until the deep breathing starts to work and we're back on a very solid, very wide roadway with a steel cage wrapped around it, over a lovely bay dotted with a few rugged islands. That phobia stuff is no joke (until later of course). I've been to Bodega Bay several times, Bill and I have been here a couple years ago, and the route from Novato is all familiar territory. I've even been to this RV park before. Which doesn't mean that I go straight when Randy says to turn right. Poor Bill has to endure another "burst of excitement" until I remember there's a pull-off just around the corner of the little road. We knew when we made the reservation that our site was narrow, but it was the only one available for the duration of our stay. Fortunately I get a kick out of backing into spaces, and with Bill's clear directions we're in with one try. As the winds pick up we're happy to be tucked away with a hill behind us and a small view of the marina. 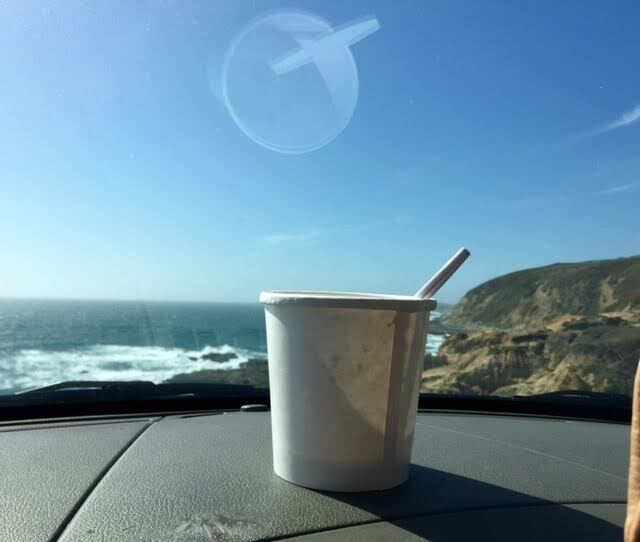 Tradition dictates (the BFF and I always do this when we're here) that we stop at Spud's Point for a cup of clam chowder to enjoy overlooking the water at Bodega Head. So that's what we do. Today we're off to explore one of my favorite places in California. While much of the state is under heat warnings, it's 48 degrees this morning. All's well that land's well, and we definitely feel that the last few days have been worth the nonsense of the few before. 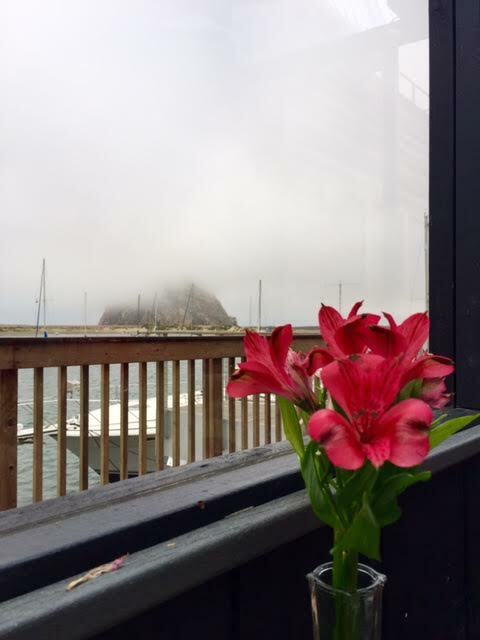 Morro Bay is not a new stop for us, in fact Bill lived here his senior year in college at Cal Poly, San Luis Obispo. But it is a whole new world for both of us to be retired, living in our beautiful home, and having the time and space to just "be" here. 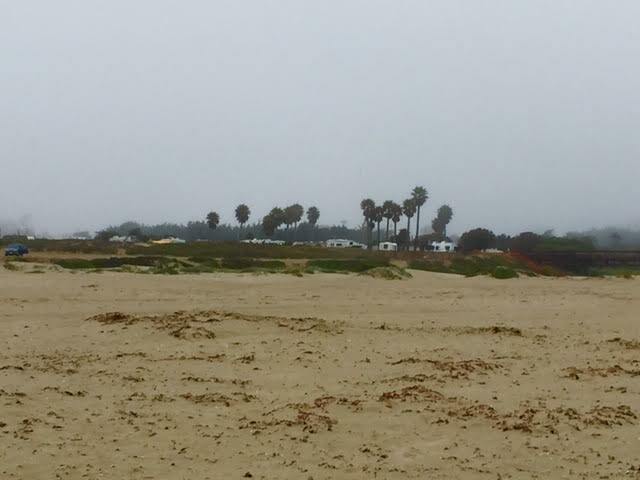 The Morro Dunes RV Park is very quiet, even at 90% full. It is a mix of retirees, families and young people with surf and paddle boards. There are tents, small to large motorhomes and 5th wheels, and lots of travel trailers from very old to very new. Plentiful and clean bathhouses with laundry rooms ($2 wash, $.50 dry), a nice dog run, and a small store with basics. 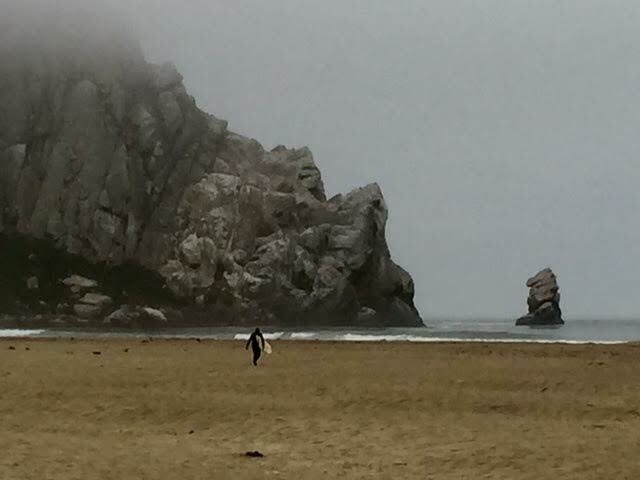 The access to the beach (dog-friendly), and Morro Rock, make the location ideal. We will definitely be back. 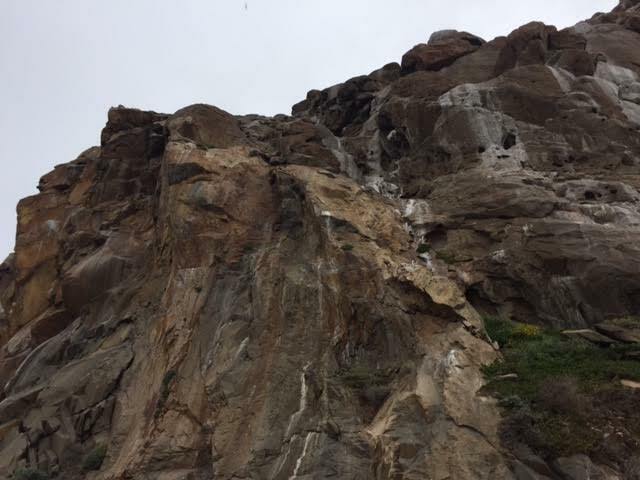 One morning we drove out to the other side of Morro Rock where you can get up close to the shear rock walls that tower overhead. Not sure why a big ol' rock is so fascinating, but it really is :-) No seals or otters, but lots of birds. Lots of people for a weekday too. Summer break is here. With our restricted diet we have been fixing all our meals at home, but one day we enjoyed lunch at a little place on the marina. One of only a couple dog-friendly eateries in town, it's a nice place to take a break out of the wind while watching kayakers navigate the small boats in the harbor. Tessa and I ventured out a couple mornings to enjoy second cup on the beach. With only the sound of the waves, and the occasional surfer, it is a most wonderful place take a deep breath and appreciate how lucky we are.